At some point in the 1920’s, Mahatma Gandhi quoted a sentence that has stuck with me ever since I first heard it. 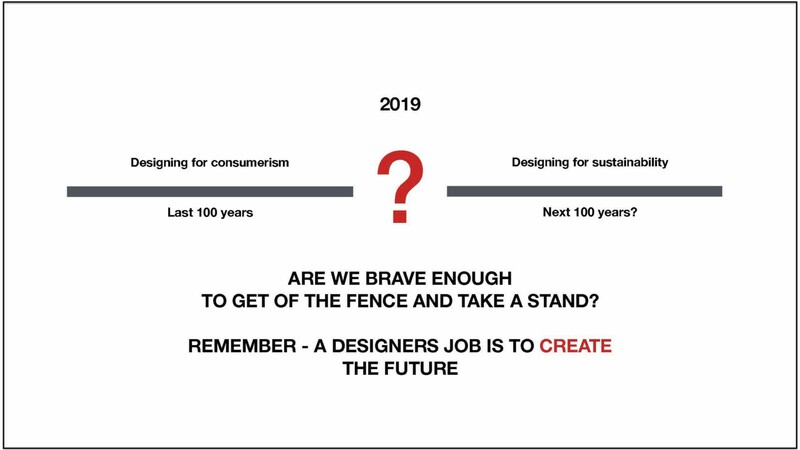 Those words were always in the back of my mind as a designer, but in the last few years they have become the guiding principle for everything I do, not only as a designer but as a citizen of planet Earth. It would have been impossible for Gandhi to imagine what kind of future would unfold before him, but unfold it did, and in my opinion not always in the best way. In the last 100 years humans have invented many things. In fact, our incredible ability to invent and innovate has directed the human story, our culture and our relationship to the natural world. Early on, we chose a carbon based economy. Oil and coal being the sole source of energy for all power production and industry. Yet within only a century, uncontrolled CO2 emissions are now responsible for the rapid climate change that is threatening all life on Earth. In the late 1950’s we invented plastic. For the product designer, plastic was a dream material. Easy and cheap to produce, it could be moulded into incredible shapes and coloured in all variety of shades and textures. It was durable too, so durable in fact that it sits in landfill for 1000 years before decomposing. Today plastics litter every ocean on our planet, and can even be found in all commercial bottled water. I guess what goes around, comes around? The industrialisation of food production and factory farming has enabled us to feed 7.7 billion people with affordable, highly convenient packaged and processed products. But it’s shocking to see that of all the worlds agricultural land, nearly 80% is used to graze livestock or to grow food for livestock, yet meat provides only 18% of our calories. In the next 20 years it is predicted that the global population will grow to 10 billion hungry people. I wonder where all that extra food will come from? But it’s not only a supply problem. Every year Americans throw away 40% of all edible food. Europe is not far behind with Finnish food waste figures at around 30%. High street shopping seems to be on the decline, but don’t worry, consumerism is thriving. Despite a change to more non-materialistic attitudes from Millennials, we are consuming more than ever. The digital age has accellerated our desire for choice, personalisation and convenience. It’s now considered poor user experience these days if we don’t recieve our package same day or at least next day, even when it’s being sent from the other side of the world. In America, 6% of people now suffer from Compulsive Buying Disorder. Our ever increasing love for screen time is also a major contributor of CO2, as the energy needed to run the server farms that keep the internet alive are now responsible for 2% of global CO2 emmissions, the same as the whole airline industry put together and predicted to be 14% by 2040. The reason being is that today, only a fraction of the energy production for server farms comes from renewable energy sources. Let’s hope that changes soon. Anyway, enough of the doom and gloom. Let’s do something about it shall we? Are you brave enough to take a stand? If we again consider Mahatma Gandhi’s quote “The future depends on what we do today” Then I would ask how much longer can companies continue to design and implement products and services without any real consideration into whether they contribute to Planet Positive or Planet Negative outcomes? Existing products and services need to be assessed and their value chains optimized to reduce energy use and CO2 emmissions. New products and services need to be designed from day one with Planet Centric as the driving force. Corporate Responsibility has now become Corporate Opportunity and it’s business critical, sitting at the top of the strategic “must win battles” of every company that really cares, and to be honest, wants to stay in business. Management consultancies, design companies, tech consultancies all over the world take heed. If you’re not helping your customers to become more sustainable, then you’re not a relevant consultant, and before long you’ll be out of business too. 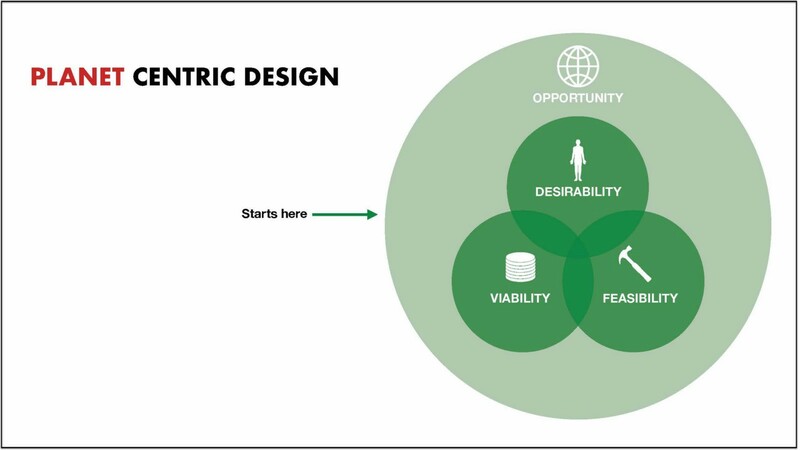 In other words, designing for sustainability, now beats end user desirability, feasibility and business viability hands down. If it’s not sustainable, then it’s not going to fly. In fact this critcal evolution of the design process is well overdue. We’re already about 30 years too late! Vincit is taking a stand, and right now we are creating our own way to design for sustainability. In April 2019 we are kicking off an internal strategic project to develop a toolkit and way of working for our customers that makes it possible to design digital services in a fully Planet Centric Way. We’re also developing a measurement system that is able to score a digital service, and allows users to understand how the service contributes to a more Planet Positive future. We’ll have the first commercial trials by the fall and then we’ll start to integrate Planet Centric Design into every digital project we do. Together, working with strategic customers who share the same values as us, we’ll scale up the impact and drive global thought leadership around this important topic. One personal goal for me, I hope that we can engage designers and developers across the world and help them to get on board. We are planning to open source the materials and methodology so anyone who has the interest can begin to start designing digital services in a more Planet Centric Way. We’ll keep you posted on the development.